Seers also met President Ram Nath Kovind and submitted a copy of the resolution to him, while requesting him to ask the government to fulfil their demand. Upping the ante for the construction of a Ram Mandir in Ayodhya, the VHP on Friday said it was fighting a “final battle” and set a “deadline” for the BJP-led central government to bring an ordinance for it in Parliament by the end of the year. Mounting pressure on the Centre, the VHP demanded immediate passage of a legislation in Parliament for construction of a grand Ram temple in Ayodhya, saying it cannot wait indefinitely for the judicial verdict. The demand was made at a day-long meeting of ‘sants’ which discussed the issue in the wake of the Supreme Court decision to begin hearings on the original title suit later this month and the strategy to be adopted for hastening the process of temple constrcution. After the meeting, the seers also met President Ram Nath Kovind and submitted a copy of the resolution to him, while requesting him to ask the government to fulfil their demand. “A delegation of sants met President Ram Nath Kovind and apprised him of the feelings of millions of Ram devotees, sadhu-sant and dharmacharyas and urged him to make a law for a grand Ram temple at Ram Janmabhoomi soon,” said a resolution passed by a committee of the sants. In the meeting, Swami Vasudevanand, one of the campaigners for the temple, urged Prime Minister Narendra Modi to convene a joint session of Parliament to pass the legislation. “We urged the President in a memorandum that he write to the Central government asking it to bring legislation for the construction of Ram Mandir in Ayodhya,” one of the sants told a press conference after meeting the President in the presence of Vishwa Hindu Parishad (VHP) Working President Alok Kumar. Addressing a press conference, VHP’s international working president Alok Kumar set the “deadline” for the government to bring the ordinance in Parliament by the year-end. “This is the final battle for the construction of a Ram temple in Ayodhya. The government should bring an ordinance for the construction of the temple and this should be done by the end of this year,” Kumar said. Describing the Narendra Modi government as one of “Ram bhakts”, the VHP leader expressed the hope that it would acknowledge the feelings of crores of hindus in the country and bring the law “before the sunset of 2018”. “If that does not happen, then all the options are open before us. 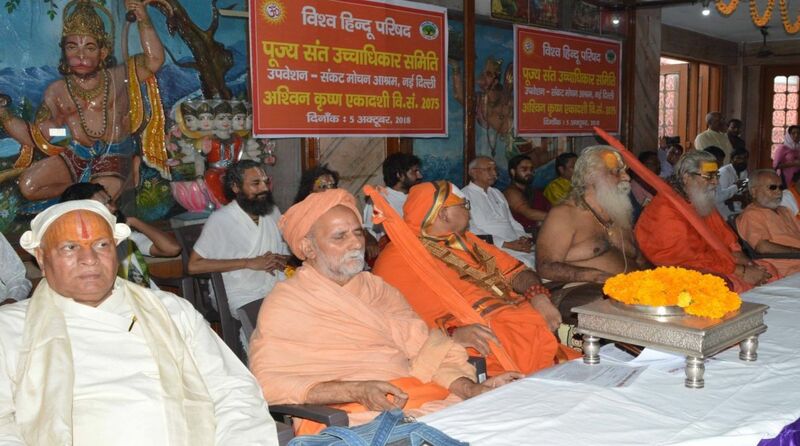 The future course of action will be decided during the two-day ‘Dharam Sansad’ to be held next year on the sidelines of the Maha Kumbh in Allahabad,” Kumar said. He categorically said that only a temple would be built at the site in Ayodhya, while informing that the “Dharam Sansad” would be held on January 31-February 1, 2019 and all the prominent seers from across the country would take part in it. Without naming Congress president Rahul Gandhi, Kumar said the “janeudhari” (one wearing the Hindu sacred thread) leaders, who had recently started visiting temples, should also support their demand. He also mentioned that in 1989, the BJP had passed a resolution at its national meeting in Palampur for the construction of a Ram temple in Ayodhya. When it was pointed out that the matter was still sub-judice in the Supreme Court, Kumar said it was unlikely that the verdict would be pronounced anytime soon. “I think the Supreme Court neglected its duty. We have waited for long, now we cannot wait,” he said. Sharing the VHP’s plans for the coming days, Kumar said huge public meetings would be organised in all the parliamentary constituencies across the country, demanding an early construction of the temple. Delegations will meet their respective MPs and raise the demand for the construction of the temple in Ayodhya, he added.